At what age should my child use your study? We have found that our Quiet Times for Kids studies are useful for ages 6 – adult. Any child that is an independent reader and can write a sentence or two on their own should be able to complete the studies and even adults have been blessed by them as well! If your child is not an independent reader, you may choose to do the studies alongside your child until they are able to complete them on their own. This can be a great way to connect with your child by reading and studying Scripture together. Do the Bible Studies come in a hard copy or a downloadable file? Each study comes as a PDF download that you will receive immediately after purchasing. We do not produce hard copies in order to keep our cost down. We have also found that the vast majority of families prefer an instant download so they can print multiple copies for each of their children as needed. You will find that the actual text on each page is minimal so it requires very little ink to print out a whole study. After printing, simply punch holes in each study and insert into your child’s custom Bible Study Notebook. Instructions to make the Bible Study Notebook, complete with pictures, are included with each study. If you are interested in a hard copy, we do have a limited number of copies of the Armor of God Study. Please contact us via email if you would like one. How long will it take my child to work through each volume? If your child averages four quiet times a week it should take about 4-5 months to finish each volume. The individual studies take somewhere from 4-6 weeks each to finish. What time of day do you recommend they do their quiet time? For some families, quiet times my be something you want to complete first thing in the morning, even before breakfast. For others, it may be the first assignment you give to your children to start off their school day. 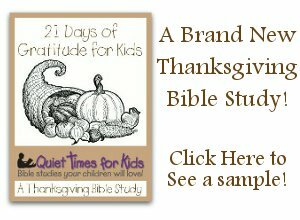 This can be a blessing to mom as it will give her a little time to prepare the lessons for the rest of the day as the children work on their Bible Study Notebooks. In our family we have found that the best time for us is in the afternoon while our little ones are napping. We have always made it a practice to have the whole family take a quiet time around 3:00 in the afternoon and having these Bible studies has been an invaluable tool to give our older, non-napping children something productive and edifying to do while the little ones nap. We encourage you to try different times of the day until you find what works best for your family. Can my child do this independently or will they need my help? Yes, this program was designed by a very busy mom to be edifying, independent work for children! As long as your child is an independent reader and is able to write a sentence or two they should be able to complete most of the Bible studies. Of course we recommend that you go over the work your child completes and use it as a tool to gauge the spiritual growth of your child. Do they need to be completed in the order they come? No, you can complete any study at any time. Actually, what we recommend is that you purchase both volumes and print out and use each study as your child needs them. You know your children best and you will be the best person to discern which study they need at that time in their life. When I notice a particular child struggling with an issue, for example peacemaking, I will print out that study and sit down with that child and explain why I want them to work on it. Are there any other books required for my child to use Quiet Times for Kids? Of course your child will need a Bible to complete each study. Other than that, the only other books you will need are a 3 ring binder and Trial and Triumph by Richard M. Hannula when completing Volume #2. This book is an excellent introduction to church history. What version of the Bible do my children need to use for these studies? Your children can use any version you want them to. Each Bible study is ‘Bible version neutral’ meaning they will work with any Bible version.